Providing you the best range of aluminium scaffolding for access &amp; high rises with effective & timely delivery. We can provide heavy duty Aluminium Access Scaffolding with special aluminium alloy & unique snap lock ledgers that allows to build heavy duty scaffold for high rise towers. Its unique quick-acting wedge-lock mechanism on standards spaced at every 500mm, can easily allow scaffolding upto height of over 60m. Consult our design department for more information. 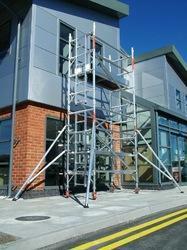 Looking for Aluminium Scaffolding for Access & High Rises ?